If you don't want to go with a Bimini top, perhaps a small boarding ladder so you can jump in and cool off! Mark Coleman has a bimini on his Utility and it looks pretty good. I too underestimated the sun and sitting on a boat with no shade. A boat with shade be it a bimini or a built-up structure definitely makes boating in the middle of summer more enjoyable. While it doesnt work while underway or if its really windy, using a beach umbrella can work pretty well while you are stopped. A simple 1" hole in the middle seat and a block of wood with a hole through it as a receptacle against the floor can keep it in place and be barely noticeable when not used. Swimming off a Utility can be a little difficult to get back in since there is not a lot of room to step on the motor leg and lift yourself in. I've stopped at a strangers dock before just to jump in to cool off then hop back in the boat and continue on. Seriously though, with the sun as brutal as it is out here, I won't even consider going out until I have some sort of bimini top rigged up. I'm seriously reconsidering my position on drain tubes. It's been raining a lot here lately. Even with the nice boat cover I bought, there was still this much standing water in the boat when I took it to the lake last weekend. Not sure how long the water was there... at least 2-3 days. Mike, I bought a drain tube flaring "tool." I'm done with it now if you want to use it. I also have an extra drain tube because I decided to only do one on the port side of the keel. I'll bring it to G12 or can mail it to you. Flaring tool? All you need is a bolt and three washers. Cut the tube 1/8 to 1/4 long. put a bolt that is smaller than the hole through with 2 heavy washers on the pre-flared side and one lighter ones on the new side. Bend the new side a little. As you tighten the bolt, the single washer will start to dish and flare the tube. It will pull the tube tight in the hole at the same time. I know, too little too late. I've seen that suggestion before, Bill. But I bought the flaring tool anyway. I'll pass it on to Mike and when he's done he can send it to the next guy. It's funny, when I was talking to the mechanic that installed my motor he said that he would have let me use his. Oh well, I've wasted more money on stupider s%$t. Advice is free. Experience sometimes cost money. God knows I've had a lot of experience. We can compare drain tube flares at G12. Mike, if i stored the boat like you are now I would have drains. For garage storage I stiil havent needed/wanted them. Yes... I knew that keeping the boat outside would come with some challenges like this. But.. I needed room in the garage to build the Zip. At some point, I may move the boat into a storage facility. We'll see. Even now that the boat is built, and I'm using it... the little Utility is still teaching me a lot. Sometimes it astounds me, just HOW badly something can go wrong. I thought drilling the holes for the drain tubes was going to be fairly simple. Sure, there was a little hiccup on the first one, but it was workable. I made my measurement for where to drill the second hole... gave myself a little extra room for clearance, or so I thought, and ran the hole saw right into the transom knee. "No problem," I thought. I'd just widen the hole a little, then fill / repair the gap later. THAT did not go so well. Bill's tagline, "There can be no miracle recoveries without first screwing up" kept going through my head. I knew I needed to patch this mess up as best as possible. After that, I can re-visit this second hole. So, I went back to the hardware store and bought a slightly larger hole saw (1-1/4"). With that, I cut a "dowel" out of some 2" thick mahogany scrap. 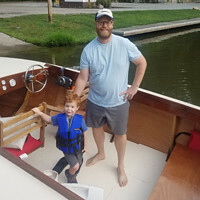 I packed the pilot hole with thickened epoxy, coated the outside of the dowel, and the inside of my transom mess... and tapped it into place with a hammer. Once all that has cured, I'll see about relocating the hole a little higher to match the first one. Maybe 4th time's a charm. Mike, it's gonna be okay! That's a solid fix. Boat was a week old when I had to make this repair. If you don’t have to fish her off the bottom, it’s an easy fix.